The temple is among the 108 divyadesams of Sri Vaishnavas and comes under Choza naatu divyadesams. The presiding deity here is Sri Naanmadhiyaperumal and thayar is known as Thalaichanga naachiyar. The festival idols are called Vyomajoyipiraan and Senkamalavalli thayar. The idol of Andal in this temple is very mesmerising and the shell in the Lord's hand is said to be very precious. When Devas and the demons churned the milk ocean for nectar, Chandra appeared before Sri Mahalakshmi, hence enjoys the status as Her elder brother. He occupies the second place next to Sun in the planetary line. The other story is that he was born to Sage Athiri and his wife Anusuya, according to Puranas. Moon is handsome and is the disciple of Jupiter and well versed in scriptures. He conducted a yajna called Raja Suya which was attended a huge number of Rishis and Dhara wife of Jupiter. When they looked at each other in the event, they began to love each other. Shocked Deva Guru Jupiter reported this to Lord Vishnu and cursed his disciple with leprosy. Meantime, a son was born to Moon and Dhara named Bhudha, also a planet called Mercury. As advised by Lord Vishnu, Moon returned Dhara to his Guru. Budha hated his father for his misdeed, performed severe penance and became a planet. Moon committed the next mistake. He married the 27 daughters of Daksha promising him that he would treat each one with equal love. But he did not. He was very fond of Rohini alone and ignored others. The aggrieved daughters approached their father-Daksha and narrated their condition. Angry Daksha cursed that his handsome face will depreciate day by day. Full moon began to face the impact of the curse. Chandra had to suffer a double curse. He surrendered at the feet of Lord Vishnu for relief. Perumal advised Chandra to visit Srirangam, Tiru Indalur and Thalaichanga Naanmadiyam, have a dip in the sacred springs there and perform penance on Him for relief. Chandra meticulously followed Lord’s advice and got the relief at this place-Thalaichanga Naanmadiyam. Lord granted darshan to Chandra and also wore him as an ornament on His head. Several inscriptions dating back over a 1000years to the rule of Para Kesari Varma, Raja Raja Chola and Rajendra Chola period are seen on the outer walls of the Prakara that indicate significant contribution made by these rules to this temple and the. In ancient times, Thalaichangadu was a commercial hub renowned for Conches, with the Eastern coast of Kaveripattanam just around 7kms from here. Thalaichanga Naan Mathiyam Perumal temple’s legend has close connections with at least two other Divya Desams – Ranganathaswamy temple at Srirangam and Parimala Rangan Temple at Thiru Indhalur (Mayiladuthurai). To cleanse himself from his sins, Chandran requested Brihaspati to suggest parikara and was directed by his Guru to invoke the blessings of Lord Vishnu for atonement from his sins. As the first step in his three phased parikara, Chandran undertook bath at the Chandra Pushkarani and performed service at the Ranganatha temple in Srirangam for 15 years. This helped him liberate himself from his ‘physical disease’. Subsequently, he moved to Thiru Indhalur (in Mayiladuthurai) and offered prayers to Lord Parimala Rangan. Answering his prayers, the Lord reduced the severity of his curse and brought back a few of his handsome features. As per Chandran’s request, this place in Mayiladuthurai came to be called Indhunna (a name denoting Chandran) - later Indhalur- and this region was referred to as Chandran Kshetram. 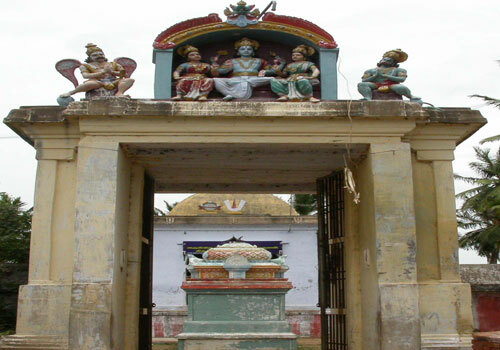 Finally as the culmination phase of his parikara process, he came here to Thalaichangadu Kshetram (Aruna Vana Kshetram) had bath at the Theertham and undertook severe penance invoking the blessings of Lord Vishnu who appeared here in a Chandra Vimana along with Shengamalavalli Thaayar and liberated him fully from all his curses. Hence the Lord here is also referred to as Chandra Saabha Haran. A pleased Chandran requested that the Lord fulfil the wishes of devotees who pray sincerely to him at this temple, just as he did and to relieve them from curses and doshams. The temple is open from 06:00 a.m. to 11:00 a.m. and from 05:00 p.m. to 08:00 p.m.
Thalaichangadu is 15kms East of Mayiladuthurai (the same distance from Sirkazhi) on the Karaikal Highway and 2kms from Karuvi/Poompuhar Entrance Arch. From Mayavaram, buses every hour to Karuvi/Thalaichangadu. From Sirkazhi, one can board the Karaikal bound bus to reach the temple in 45minutes. From Mayiladuthurai, auto will cost Rs. 250 to Thalaichangadu. 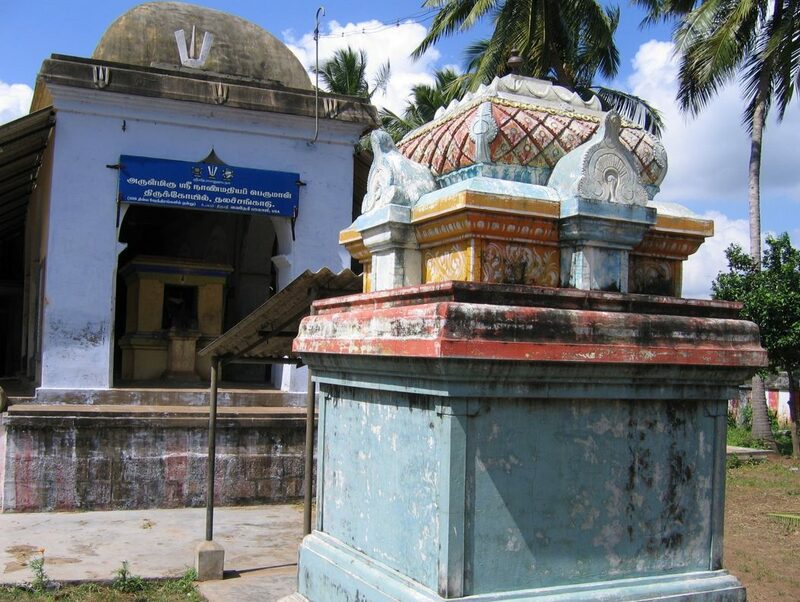 Sri Naanmadhia Perumal Temple, Thalaichanga Naanmadhiam, (Thalachangadu)-609 107, Nagapattinam district.